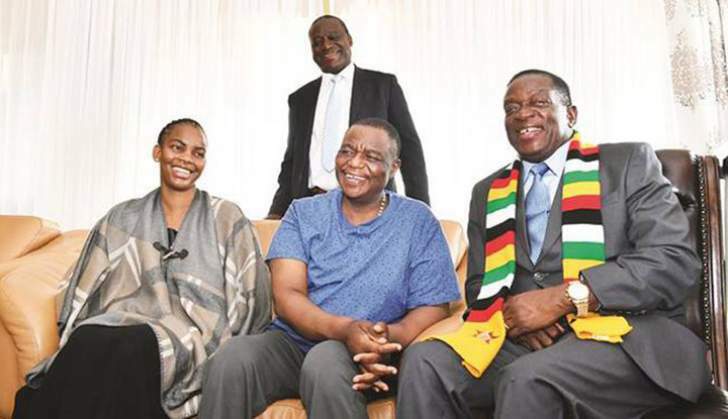 President Emmerson Mnangagwa's spokesperson George Charamba has revealed that he once considered throwing in the towel, but changed his mind after he was persuaded by his new boss. Last year Charamba, who doubled up as former president Robert Mugabe's spokesperson and Information ministry permanent secretary, pledged to retire when the 94 year-old politician left office. Charamba (GC) told our senior reporter Veneranda Langa (VL) in an exclusive interview that he had "selfish reasons of wanting to retire." He also spoke about Vice President Constantino Chiwenga's alleged poor health and his alleged strained relationship with the president. VL: You were recently elevated to be deputy chief secretary to the president and cabinet. Please briefly tell us what your new role is and how is it different from your previous assignment as presidential spokesperson? GC: The first difference is that obviously it is a new title and a new salary, but this is a higher responsibility - both in terms of hierarchy of the service and of course in terms of the tasks I am expected to be charged. In my case my remit is now narrow. It focuses on the president and his office - the president the person, the president the party leader, the president the head of government, and the president the head of state. So, you have a compendium of the personal, the political, the ceremonial and the executive - all roles in one because once you meld all those functions then you have a short end of who the president is, and my role is to evolve a communication strategy which projects the president as an individual, as a person, what his ideas are, what his values are, what his leadership style is, how he thinks, what his philosophy in life is and this bears to the president as an individual, and to project him as the leader of Zanu-PF because it is the party, which conceives the ideas that run government. Essentially there is a pre-eminent role for the president as a leader of a political party because this is the figure that takes the party to an election and win - and a figure who is also the head of an outfit that brainstorms and creates the ideas that rule the society. So, we are moving away from ruler ship to leadership, and leadership's hallmark is communication, interaction and connecting with the citizenry, and it is a key responsibility that this department that the President has just announced has to fulfil. When you take into account the president's office, the VPs offices and the office of the first lady you will have the ecology of the presidency, and this department must actually create a communication strategy that encompasses that ecology. My biggest disappointment is that the media industry remains polarised, not necessarily because of weaknesses of players in your industry, but because the industry is divided by people coming outside the newsroom - by way of foreign governments, NGOs who are not in fact media outfits, by way of political actors and as you would allege by way of government. Once you succumb to these sources it means you cannot sustain your claims to be a fourth estate, and that is my major disappointment - the inability to create estates, which counter balances all other estates as it should be the case, but one that is reduced to a vessel by other dominant Estates. Can you tell me one good reason in this planet why we need to have seven delivery vans, each carrying 5000 papers and going in the same direction thereby operating sub-economically - same direction, same trip and same small number of newspapers for the same reason? Can you tell me one good reason on this planet why each title needs to have its own printer - and these are not modern day printers. But, there is one area where you are still very weak - economic news reportage, you journalists are totally ignorant and I am sorry to say when it comes to economic news you know nothing. That is why most of you end up writing politics in business, you are running from your own ignorance and I am just hoping that this is one area where my successor Mangwana might want to look at to ensure that there is a special facility for training journalists - more so in an environment where the president has declared that Zimbabwe is open for business. Journalists' skills must show that business intellect which we then need. So, really I don't think there will be any difficulties for him to settle in. The only organisation where we have seen rapid strides in ensuring that skills are upgraded - in fact is Zimpapers because the Zimpapers newsroom has transformed and it is showing by way of the degree of analysis - not shallow political analysis. The rule of thumb in politics is that you do not retire ahead of an election because it smacks of a desertion - and I am not a deserter at all. President Emmerson Mnangagwa then said to me I hear you talking about the idea of deserting, and so are you suggesting that my policies are so smelly that you won't even want to associate with them? The President has to govern in a digital age and the hallmark is that ideas, thoughts and feelings - whether positive or negative do not require the printing press or newsprint to be published, read or broadcast. Recently there were unusual developments where Amai Chiwenga gave up her organisation Musha Mukadzi so that the first lady (Auxillia Mnangagwa) can run it as Angel of Hope - but that is the spirit. There is only one first lady and everyone rallies around that. When the White City tragedy struck, Zanu-PF went to elections without the national chairperson Oppah Muchinguri because she was badly injured. The first is to allege conflict and invent it. The second is to invent illness - that VP Chiwenga is dying and bed ridden, and given my state in government I can relate to them because those are techniques to destabilise an outfit, except that we have three trained soldiers, two intelligence ministers, and one is commander in the presidency - and how do you divide them. VL: MDC Alliance president Nelson Chamisa has indicated that he will not occupy the office of opposition leader that the government says it's in the process of creating. What is Mnangagwa's position on that? It was adversarial - us versus them as if our lives are shaped by elections. They are not - elections last for only two months from proclamation. A law and policy have not even been made. If it takes us five years to create that - then fine. We have an opposition leader who lost the elections and whose defeat was confirmed by the Constitutional Court, but that opposition leader still insists on the basis of his belief - and not the ballot -that he won and that the victory was stolen. Such disposition does not make for an environment of interaction and no one should be left in doubt that there is a crisis of legitimacy in Zanu-PF.